Mexican Street Corn, or Elotes, is the ultimate in simple comfort food. Using a base of crema, pumped up with spice and cilantro then topped with cotija cheese, we put a Chef Sous Chef spin on the classic and created two additional variations; Greek and Caribbean. You’re never going to want to eat plain corn on the cob again. When it comes to summer, there is nothing more nostalgic then biting into a freshly buttered cob of corn. Hitting every sense, the pop of the kernels, the sweet taste, and that movie theatre popcorn smell, there’s something special about eating off a cob. As early summer turns to late, the farmers stands in the market change from berries and greens to stone fruits and vegetables like corn, exciting us for a taste of our favourite mid-summer treat. We’ve previously shared our love affair with corn: holding cobs of corn wrapped in its husk; it’s as organic and natural as harvesting corn directly from the field. Peeling the leaves to expose the first few rows of kernels, unzipping the leaves as you invert the husk to reveal the full cob, and picking away remaining hairs is a third of the experience. The second third is the textured sensation of biting into the fleshy kernels or the bumpy path of the knife as it grazes the cob. And the final third is eating it, of course. Corn is one of those ingredients that is delicious without doing anything to it other than boiling it. You can take to the next level by roasting it over an open fire or grilling it on the bbq. It’s also a staple ingredient in our home year round with a few of Mystique’s favourite inclusions in Shepherd’s Pie, Corn Chowder and Quesadillas. But if you really want to ignite your senses, a simple cob of corn can be used as a vehicle for a variety of flavours, including Mexican Street Corn. Traditional Street Corn or Elotes, is made by roasting corn on a flame and slathering it in a spicy Mexican crema, rolled in queso cotija and topped with a sprinkling of cilantro. With notes of sweetness from the corn, spiciness from the pepper, cooled down with the cream and brightened with the fresh cilantro, this is a summer essential dish paired with anything the BBQ has to offer. 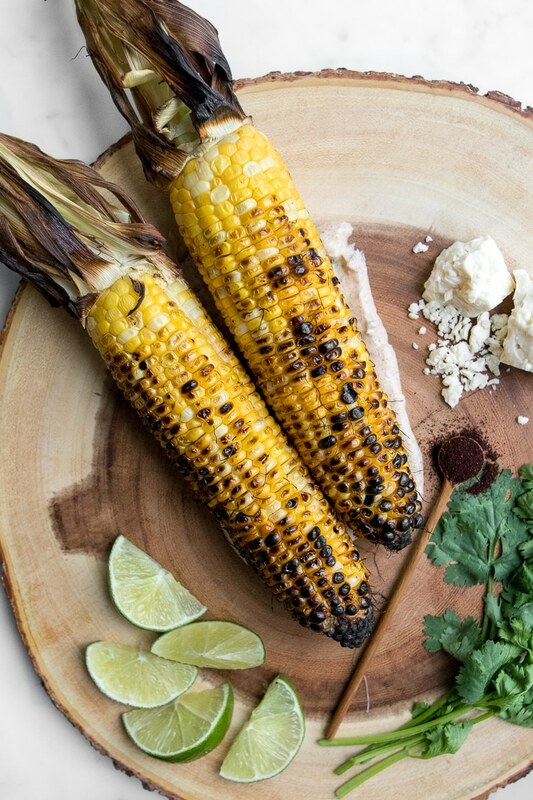 Celebrating the golden ingredient of summer, we honoured the traditional Mexican Street Corn and put a Chef Sous Chef twist on the classic adding new flavours and cultures to the cob including Greek and Caribbean. Simply adjusting the crema flavours, we added in notes traditional to each counties culture and were pleasantly surprised with the combinations. Before we tell you how we made it, Elotes or Mexican Street Corn is a dish of cooked corn slathered in a spicy mixture of crema, and chili powder then doused in cheese. Called Mexican Street corn because it’s often sold on the street by vendors or at festivals in Mexico. Creamy and cheesy with a punch of limey zest, our take on the Mexican Street corn is the perfect way to round out the end of summer. Mix a small spoonful of chipotle powder, and a handful of chopped cilantro with Mexican crema or sour cream. Squeeze half a lime into the mixture and give it a stir. Grill your corn and brush generously with the crema mixture. Roll in cojita cheese then sprinkle with fresh cilantro and a squeeze of lime juice. Swapping cojita cheese for feta cheese and cream for yogurt, we played on the flavours found in the Greek cuisine. Sprinkling with a light hand of oregano, and a gently squeeze of lemon, biting into our Greek Street Corn is like diving into delicious greek potatoes. Serve with chicken skewers or a lamb kebab, a Greek salad and rice for the ultimate Mediterranean spread. To make this version, mix the Greek yogurt with lemon, garlic and a spoonful of fresh oregano. (If using dry oregano, make sure to use it sparingly). Grill the corn and slather it in the yogurt. Roll in crumbled feta and top with a small sprinkling of oregano. Add a bit of heat and spice to your cob with our our curry and spicy Caribbean Street Corn. Using the same crema technique, we opted for a creamy chèvre cheese to balance out the heat of the curry, all brought into harmony with the squeeze of lime. Serve with jerk chicken and a mango salad. Mix a small spoonful of curry powder, and a handful of chopped cilantro with Mexican crema or sour cream. Squeeze half a lime and a dash of hot pepper sauce (scotch bonnet or habanero) into the mixture and give it a stir. Grill your corn and brush generously with the crema mixture. Roll in goat cheese, or use a butter knife to spread the cheese on the cob, then sprinkle with fresh cilantro and a squeeze of lime juice. If you are eating our street corn recipe at a picnic, leave the husks attached to the corn. It makes for a great handle so you don’t get your hands dirty. Peel the layers back and use a husk leaf to tie the husk together to they don’t burn while cooking. If you don’t have a barbecue, then roast the corn in the oven at 450° for about 30 minutes, turning every 8-10 minutes. The caramelization of the kernels will give the corn a sweet flavour that matches perfectly with the spice and cheese. Get creative when making our street corn for friends and family. Create a street corn bar by placing the different crema mixtures and toppings on a table and allow your guests to create their own flavours. The classic Mexican Street Corn, or Elotes, is the ultimate in simple comfort food. It’s uses a base of crema, pumped up with spice and cilantro then topped with cotija cheese. We’ve taken the classic and remixed it to make two additional variations; Greek and Caribbean. You’re never going to want to eat plain corn on the cob again. No. 1 | In a small bowl, mix together the crema, lime juice, chipotle powder, and ¼ cup of cilantro. Set aside. No. 2 | Heat the barbecue to medium-high heat. Place the corn directly on the grill, close the lid, and cook for 20 minutes, turning every 5 minutes, until the kernels begin to turn black. No. 3 | Spread the crumbled cheese on a large plate. Brush each cob of corn with a generous amount of the crema mixture. Roll the corn in the cheese, then top with a sprinkling of remaining cilantro. Squeeze the juice of a lime wedge on top and enjoy! No. 1 | In a small bowl, mix together the yogurt, lemon juice, garlic, and 2 tbsp of oregano. Set aside. No. 3 | Spread the crumbled cheese on a large plate. Brush each cob of corn with a generous amount of the yogurt mixture. Roll the corn in the cheese, then top with a sprinkling of remaining oregano. Squeeze the juice of a lemon wedge on top and enjoy! No. 1 | In a small bowl, mix together the crema, lime juice, curry powder, pepper sauce and ¼ cup of cilantro. Set aside. If you are eating these at a picnic, leave the husks attached to the corn. Peel the layers back and use a husk leaf to tie the husk together to they don’t burn while cooking. If you don’t have a barbecue, then roast the corn in the oven at 450° for about 30 minutes, turning every 8-10 minutes. This was my first time ever having street corn and it was delicious. We made all three versions and couldn’t decide which we liked best. We just used sour cream for all of them and it worked well. Love the recipe!